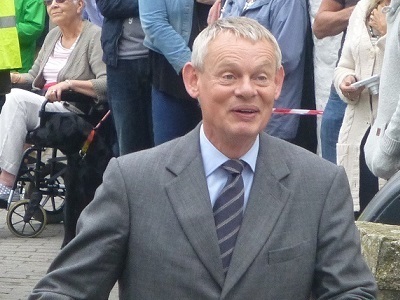 Doc Martin Filming in 2015 for Series 7! 2017 filming for series 8 in Port Isaac! Series 7 of Doc Martin was filmed in and around Port Isaac in the North of Cornwall, and every so often I headed on down there to have a little look to see what was going on. Below are some photos and videos of my days out in Port Isaac, enjoy. Sigourney Weaver guest stars in Doc Martin, series 7, episode 7 "Facta Non Verba"! 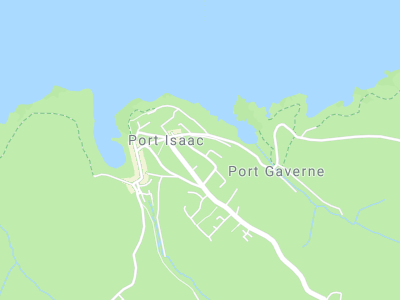 In episode 7 of series 7, titled "Facta Non Verba", Sigourney Weaver makes her guest appearance in Port Wenn, and meets Doc Martin inside the local Pharmacy, and then at his surgery. See the live filming in progress a little further down the page. Martin Clunes made an appearance on The Jonathan Ross Show over the weekend, and spoke about how Sigourney Weaver ended up making a guest appearance in Doc Martin. Below is also the preview clip of Doc Martin shown on The Jonathan Ross Show on Saturday. Today in Port Isaac, filming was taking place outside the pharmacy, with a scene that included Doc Martin (played by Martin Clunes) and a special appearance from Sigourney Weaver (about 45 seconds in), although what role she played was unclear. Standing close to where Doc Martin was taking his start and end point from allowed me to get some close up video, and Martin Clunes took a shine to my little Welsh Springer Spaniel, and every so often as the scene would end he would bend down and say hello, and at the end of one scene we even managed photo with the man himself. A great day indeed! Martin Clunes gives a big smile to the small crowd in the corner taking photos! I uploaded my photos and videos to the new Google Photos service that lets you back up and save your personal photos, and within it is an automatic creation algorithm that puts together photos and video clips for you in a longer, more entertaining collection. I think they have come out quite well, although on the second video, you may see some photos that don't really belong in the creation! In this scene, Louisa Ellingham (formerly Glasson, played by Caroline Catz) is outside of the school in Port Wenn (filmed in Port Isaac) talking to a friend or colleague, while the school childen leave for the day. You know what it's like! You're trying to film series 7 of your own TV show (Doc Martin) and people watching get in the way, and Port Wenn's local Dr doesn't like this at all and can't help but be himself!! Filming at Roscarrock Hill in Port Isaac outside Doc Martins Dr Surgery which had quite a big crowd of people watching! This video is only a bit of fun, and in actual fact, Martin Clunes simply asked the crowd to move back and listen to the producer regarding line of sight for their cameras, which was done so in a reasonable manor! In this scene, taken from two different angles, Doc Martin (played by Martin Clunes) and his wife Louisa (played by Caroline Catz) talk outside of the surgery. In this scene, PC Joe Penhale (played by actor John Marquez) is down by the bay seeking to buy some food for his BBQ. A very very small scene of Dr Martin Ellingham (Doc Martin, played by Martin Clunes) walking out from the alleyway on to the main road besides the bay of Port Wenn (Port Isaac).